So, C's been rather spoiled. 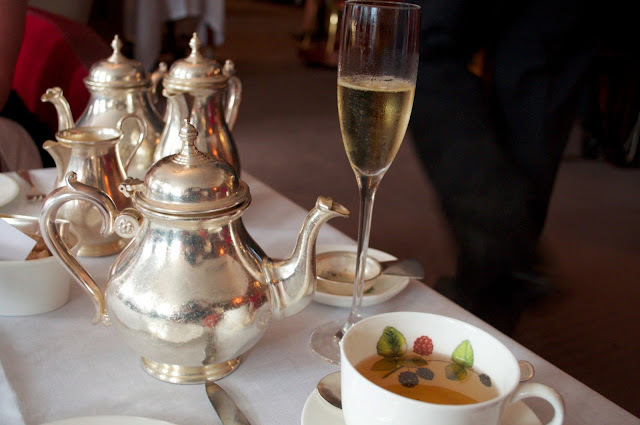 It was her birthday a while ago, and A decided to treat her to a weekend of lovely things, including a fancy surprise champagne afternoon tea at Brown's hotel in Mayfair. Lucky girl! We usually make it a policy not to blog food we have for occasions. 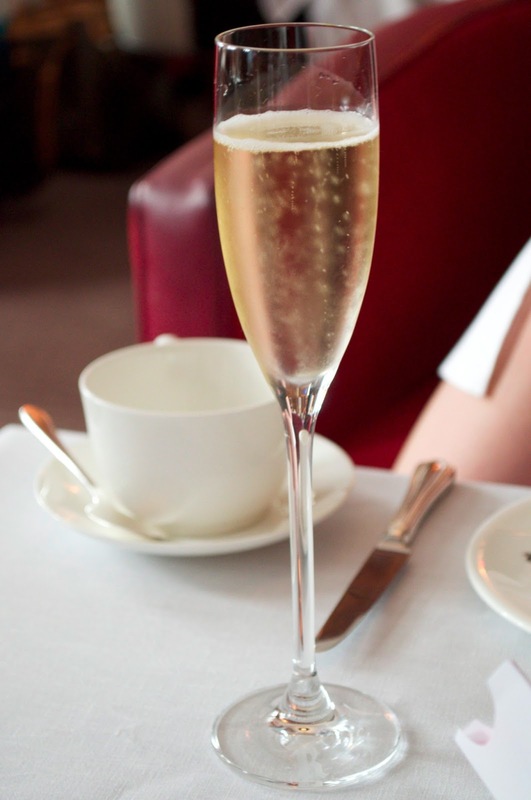 We've recently been to places such as The Delaunay and Hakkasan - both delicious - but we usually make it a policy not to worry about photography when it's a birthday or anniversary. This time, however, C insisted we make an exception: the platter was too pretty and the room too suited to photography not to capture it - and not to mention that the food was so good that both A and C agree everyone should know about it. Think of afternoon tea in London and the likes of The Ritz and Claridges spring to mind. A's been fortunate enough to try both venues for tea, but confessed he actually liked the spread more at Brown's: perhaps it's precisely because it doesn't quite have the name that it knows it has to be absolutely top-notch with the food to get away with charging similar prices. On arrival, we were a little early and so propped up the bar behind the tea room and had an eye-wateringly expensive Bloody Mary (A nearly fell off his chair when the bill came, and then downed his drink rather speedily for a bit of Dutch courage). The craftsmanship that went into it almost made up for the sky high price, though, and C savoured every sip before we took our seats in the main lounge. A had kindly decided to treat C to the champagne tea option (you can opt either for non-alcoholic beverages or to make it a little boozier) and as we took our first few sips and toasted to C being one step nearer the big 3-0 (errr), the platter of treats arrived. Both A and C's eyes widened in anticipation: it is quite a spread. 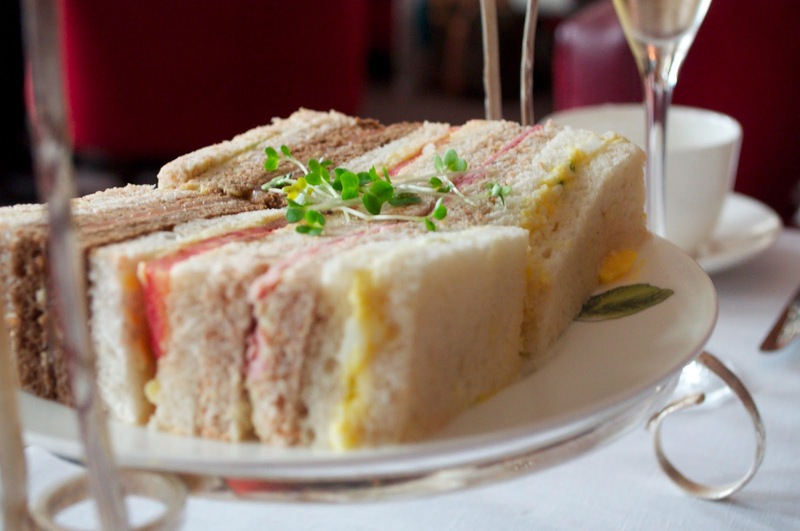 First up were the sandwiches: incredibly neat little stacks of egg mayonnaise, ham, cheese and tomato, smoked salmon and, of course cucumber, all served on various different types of bed and with deliciously generous lashings of butter, which A and C would never normally have at home. We finished the first lot off in a flash, and no sooner had we done so than we were presented with a second plate of sandwiches. And then a third. And then even a fourth. But before that, a tray of warmed small scones arrived, complete with cream and jam. 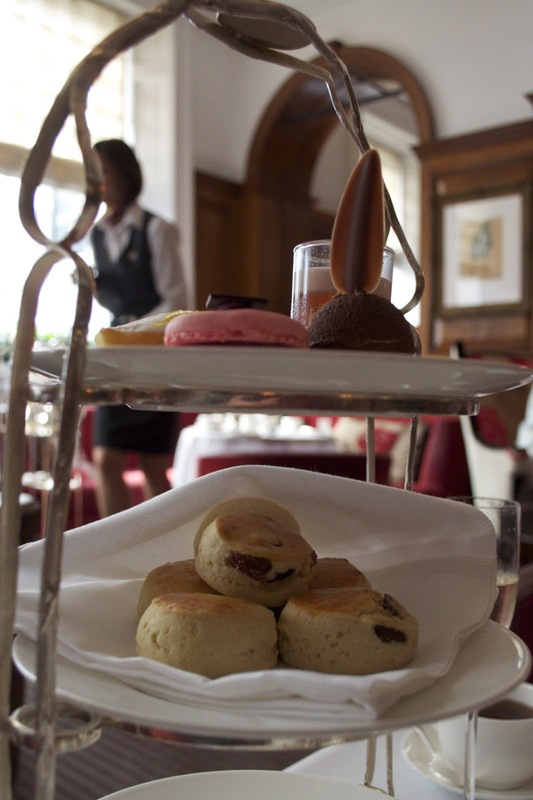 We almost cooed in delight eating them, and then had a second plate of scones too. 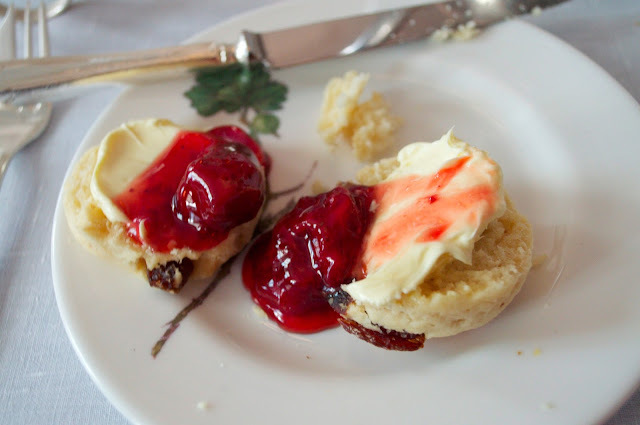 The jam was wonderfully gooey with real, large pieces of fruit, and the cream was soft enough to melt slightly into the warmth of the scones underneath, which were perfectly light and fluffy. Mmm. Next up was the last of the platter: the petit fours. These were all so delicious, and there were so many to choose from that we had a second platter of these too (see a pattern here?). As the birthday girl, C got the first choice of petit four, and so predictably went for the perfect raspberry macaron, which was crunchy on the outside and wonderfully soft on the inside - just right. A finished off a chocolate mousse ball and a jelly shot, while C also tucked into a light lemon cake. We tried our best to finish off the small raspberry tart which made up the last of the platter and then sat back, food babies and moans of "never eating again" aplenty. After a while, as A got the waitress' attention and asked for the bill, she smiled coyly and ushered him away. "But sir," she said as she sashayed past, "you haven't had your cake yet!". 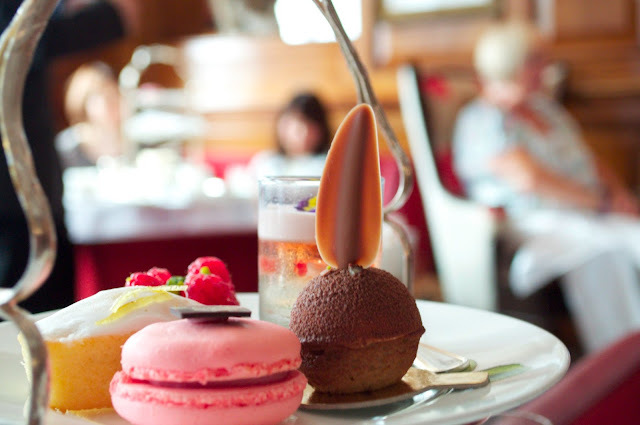 With that, a waiter approached with a tea trolley, loaded with various types of cake, each looking equally tasty. 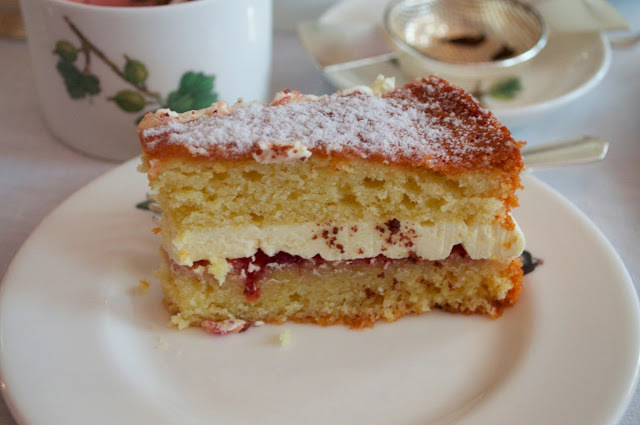 We both opted for a Victoria Sponge, and squeezed in as much of it as we could, until we really couldn't eat any more, even though we desperately wanted to. We practically rolled out of Brown's Hotel: fed, watered, fed some more and very contented, with C feeling very spoiled. Thanks A!